An unusual weather day. It was dry in Holualoa in the morning but there was a huge rain cloud dumping over Kailua-Kona. Dry, gusty and dusty in Waikoloa and fairly dry in Waimea from what I heard. 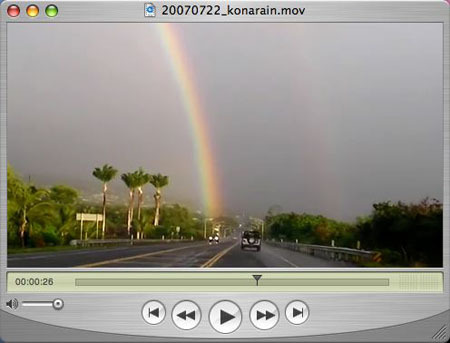 The rain just sat over Kona and in the afternoon there was an great rainbow over the Queen Kaahumanu Highway in Kona town. Cars were stopping for people to take photos and just enjoy the rainbow. And at night I felt and heard the apartment building jolt. Turns out it was a temblor near Hookena.